via kristin_a on Flickr for Meringue Bake Shop of Orange County, California. For a baby shower. The theme was Alice in Wonderland. 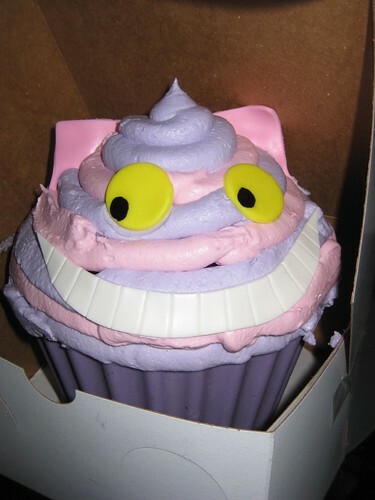 The giant cupcake is Cheshire Cat, the mini cupcakes are the queens roses (like, painting the roses red) and tea cakes in black and red. Giant cupcake is red velvet filled with cream cheese buttercream, the rose cupcakes are vanilla with vanilla buttercream, and the tea cakes are Campfire.